"Size, Strength and Energy Efficiency"
The large truss of the 12.8m span, combined with columns of 4.125m to the gutter gives equivalent growing conditions to a traditional Venlo design of over 5 metres without the associated heat loss. 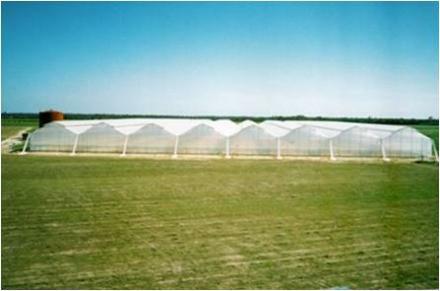 The 4x4 Twinskin greenhouses are computer analysed to provide full crop loading of 24 kg/m? and at the same time resistance to wind loads of up to 50 metres per second. 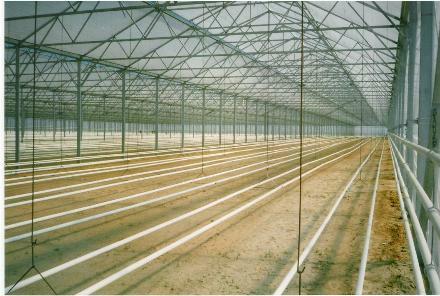 The extra crop loading allows for the use of suspended hydroponic gullies. Tomato, Capsicum and Cucumber growers will find that they can easily fit over 16 rows of crop per 12.8m span and 12 rows in a 9.6m span, giving effective use of space. While at the same time the height of the 4x4 offers ease of layering and crop management. Flower growers and Nurseries will find that the large span and height provides more efficient space for benching and automatic watering and gives a manageable buffer zone above the crop. Another benefit of the truss design is the ability to use it for support when maintaining the vents, even when a full crop is planted. 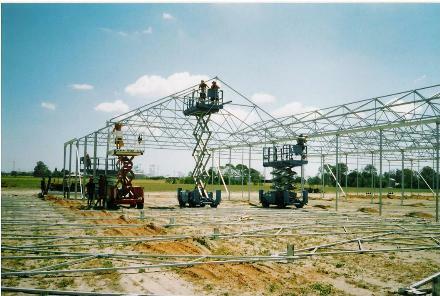 The trusses are constructed using galvanised high tensile steel. The truss spans are in multiples of 1.6m, matching international standards. We even have a variation of the 4x4 design rated for Category 2 Cyclonic Areas. 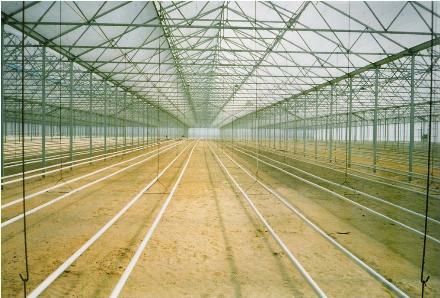 This greenhouse has a 12.8m span, a huge 4.5m height to the gutter, and a section (truss to truss) size of 3.6m. This greenhouse can not only withstand cyclones, it can do it while supporting a 24 kg/m? crop load! Covers are the latest technology twin-skin plastics, 200 micron on the outside and 150 micron inside, featuring UV stabilised polymers, EVA Infra-Red heat retention and anti condensation drip protection ensuring the best environment for your crop. Guaranteed as standard for four growing seasons in the Southern Hemisphere and fixed with Harford's Cliploc to provide long life and a cost saving recover when required. The 4x4 is easy and quick to build, the strength of a fully welded connection is combined with single sleeve joint systems to give a simple on-site assembly without the need for expensive scaffolding or cranes. Another benefit of the truss design is the ability to use it for support when maintaining the vents, even when a full crop is planted. The trusses are constructed using galvanised high tensile steel. The truss spans are in multiples of 1.6m, matching international standards. Available in 9.6m or 12.8m spans to provide super efficiency. Column height is 4.1m at the gutter. 4m section size (truss to truss) reduces shadows. Modular construction allows simple cost effective growth. Galvanised high tensile steel frame. Huge 45% floor area ventilated by gull-wing vents ensures complete control of the interior environment. Premier high technology covers minimise condensation reducing diseases and help control insect pests. University tested wind and crop loaded structure withstands winds up to 50 m/s (180 km/hr), with a crop load of 24 kg/m?. 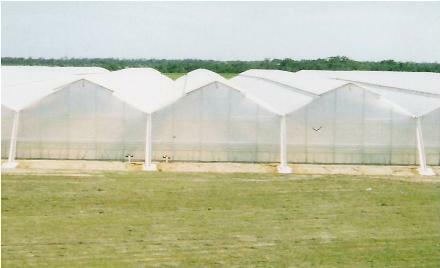 Large heavy duty walk-in gutter system designed to take heavy tropical downpours on the outside while the inside profile minimises shadow on the crop and provides anti drip condensation run off. Size: Truss span 12.8 meter or 9.6 meter . Single or gutter connected multi-bay. Length modules (section size): 4m. Doors: One, two or three meter openings. Supply: Kitsets available ex factory Christchurch 8051 or Auckland.